I have this little flaw, and it’s called impatience. Okay, it’s a huge flaw. Massive. Enormous. I attribute this to growing up in the internet generation and getting everything likerightthisverysecond. Admitting you have a problem is the first step, right? So, last night when I decided to add different ingredients to the original cookie dough dip, I was planning on waiting until later in the week to share. A sweet Christmas present, if you wish. Plus, I have a handful of savory appetizers to share! Instead of cooking dinner, I belted “I Want a Hippopotamus For Christmas” eight times until I got the perfect, whiny voice. I heard it once on Sunday and it hasn’t left my head since. Then I mixed up the three new flavors of cookie dough dip and ate 16 animal crackers and four spoonfuls of it for dinner. And grew more impatient by the second, so much so that my finger was pulsating over the publish button at 8:45. But all good things come to those who wait. Even if it’s only 12 hours. For instance… peanut butter chocolate chip cookie dough dip. And double chocolate fudge cookie dough dip. Even creamy snickerdoodle cookie dough dip. That really tastes like snickerdoodles! I wish I could pick a favorite. You’d probably get a quicker response out of asking me what my favorite song is. Except right now it’s that stupid hippopotamus song. I started by making a normal-sized batch of cookie dough dip, then separated the mixture into three equal parts – going a little heavy-handed on the snickerdoodle dip portion since it wouldn’t have any extras added in like peanut butter or cocoa powder. Each flavor ended up with about three-quarters of a cup of dip. The snickerdoodle dip actually tastes like snickerdoodle dough. I dubbed it the best dip ever. But then I tried the peanut butter combination, which literally is exactly like peanut butter cookie dough. Maybe it’s my favorite? I’m quite indecisive, but it’s with good reason. Here’s a plan: you make all three dips then report back on which is the best. It is a difficult task, but someone has to do it. Now, who’s getting me a hippopotamus for Christmas? I think it’s the only thing that will get this song out of my head. What’s In Our Fridge Right Now. What’s In Our Freezer Right Now. I’m definitely going to make these for my next book club meeting! I’m already thinking of the fun things I can bring to dip in them, yum!! Well all of these taste fantastic! However my snickerdoodle turned out looking more red like the cinnamon than dough with cinnamon specs like yours. Any reason why this happened? I made a few modifications for the holidays though that you might want to try. Just made all 3 flavors!! Divine!!! i have a son whose very sick and his favorite things are fudge and snickerdoodles is there a recipe for them combined?i tried to look in cookbooks but to no avail can u please help? Pingback: Cookie Dough Dip « Are Yu Hungry? This recipe is AMAZING! This tastes just like donut filling! How about s’mores? Add graham cracker chunks/crumbs, mini marshmallows and chocolate chunks. 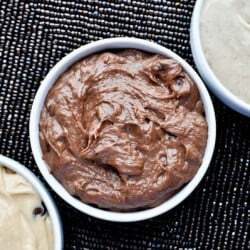 Hi, I would really like to make these 3 cookie dough dips for our superbowl party this sunday, but the link to the original cookie dough recipe doesn’t work anymore, so I don’t know how to make the base for all of them! are you able to repost it or send it to me? thanks!